On September 10, 2018, at 19:00, the Great Hall of the State Kremlin Palace hosted the Russian premiere of the ballet with operatic elements – “Crystal Palace”. The initiator and lead organizer of the Project is the European Foundation for Support of Culture (EFSC) headed by Konstantin Ishkhanov. The première of the ballet in Moscow has been organized in collaboration with the Association for Support of Cultural Initiatives (APKI) and the State Kremlin Palace. The audience enjoyed a bright costumed performance with luxurious Baroque decorations and the participation of Ivan Vasiliev, world-famous ballet star, and artists of the Bolshoi Theater and the Mikhailovsky Theater. The director and choreographer of the ballet are Ekaterina Mironova and Alexander Somov. The ballet also involves the children’s choir of the Bolshoi Theater and the School of Classical Dance headed by Gennady and Larisa Ledyakh. The ballet is set to the music of a famous American and Maltese composer Alexey Shor, whose works are recognized around the world. The plot of the performance is based on a historical episode that took place at the court of the Russian Empress Anna Ioannovna, whose role will be performed by a magnificent Ornella Muti. The two acts performance were accompanied by the Moscow Symphony Orchestra of Soloists headed by a famous conductor, multiple winner of the Golden Mask award Pavel Klinichev. 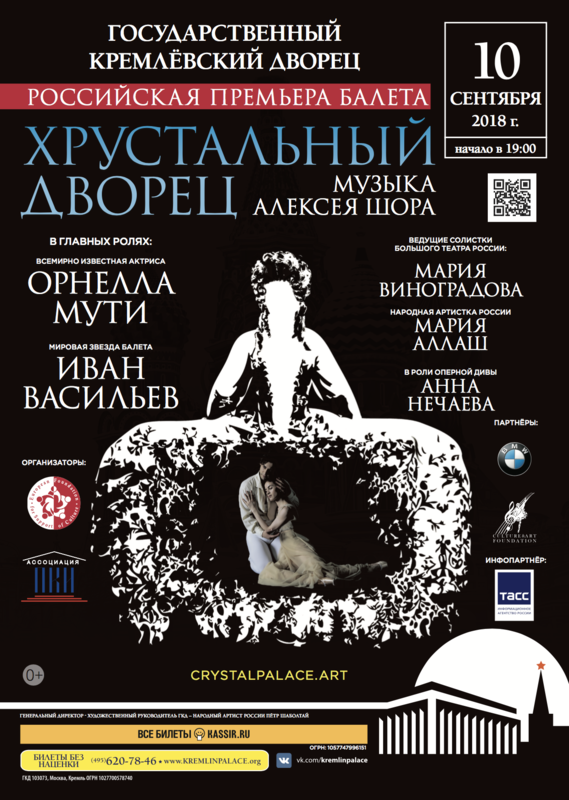 The only performance of the ballet “Crystal Palace” in Russia is a large-scale event, the unique character of which is emphasized by intercultural theatrical and musical connections.